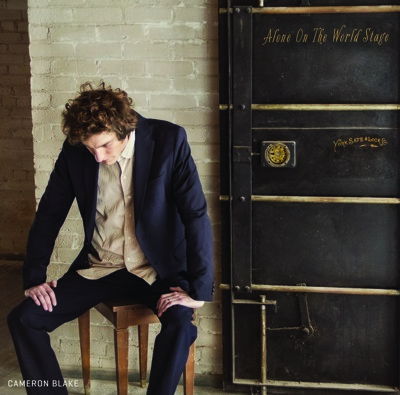 Cameron Blake left his adopted town of Baltimore for Grand Rapids, Michigan a few years ago, and seems to have left the “chamber folk” sound of his four previous albums behind him as well. Alone on the World Stage is music stripped bare: a voice, a single instrument, and arresting wordsmithing. Blake has a deserved reputation for deftly handling heavy topics and doesn’t shy away from that here – “Rise and Shine” about the Israeli-Palestine conflict, “Home Movies” about old age, and the standout strummer “Detroit” about that city’s collapse – but Alone has a surprisingly cheerful side as well. “North Dakota Oil,” set to some of Blake’s best fingerpicking, tentatively celebrates the boom economy in what was once one of the nation’s poorest states, and “Kabuki Theatre” (one of two songs performed on “a $75 upright piano”) laughs at the good ole boys through some clever wordplay. Blake explores an admirable range of moods, melodies, and textures throughout the 12-song set, which helps maintain engagement in an age when such sparse arrangements can be a turn-off. But the heart – and most spellbinding facet – of Alone on the World Stage, as with all of his work since 2009, is Blake’s intimate baritone delivery of expertly crafted lyrics.